The development of the railroad system following the Civil War brought in a new wave of immigrants. Commercial centers and cities developed around sawmills and flour mills located near water areas. The agricultural communities developed quickly. 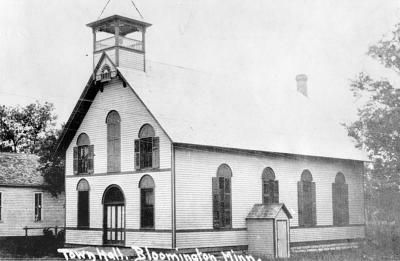 Bloomington became a town on May 11, 1858, the same day Minnesota became a state. People continued to arrive in their ox carts and covered wagons; land sold for about $1 an acre. Soon a farming community developed with its citizens helping each other. They built their barns, held quilting bees and became civic-minded with town meetings. Communication by telegraph was now available. 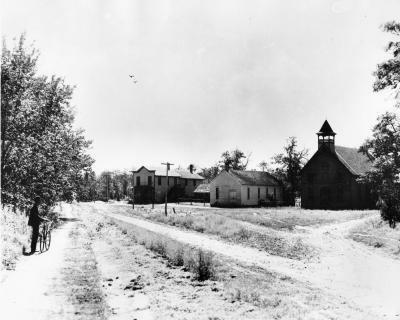 In 1892 a town hall was built near Old Shakopee Road, the former Indian trail. 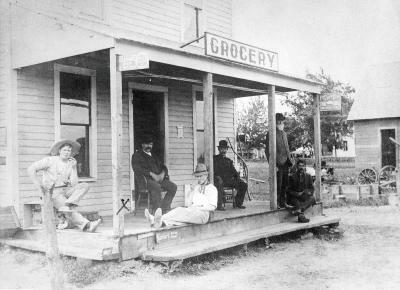 The Grange Hall and the Baillif general store stood nearby. 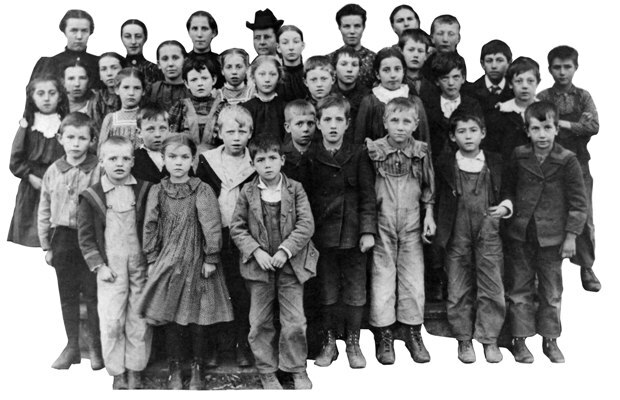 At the turn of the century, the population had reached 1,000 persons. Bloomington Town Hall. Built in 1892, the land donated by the Baillif family on the condition that it be used for township purposes. The town hall was used by the City of Bloomington until 1964 when the second city hall was built. 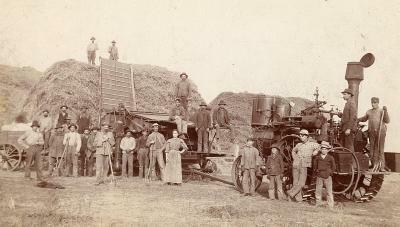 Hestor Chadwick's threshing rig and crew about 1890. Bloomington was an agricultural community amidst plowed fields, growing crops, large barns, pasturing cows and other animals. 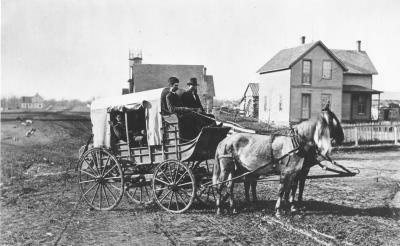 The stagecoach which ran between Fort Snelling and Shakopee. 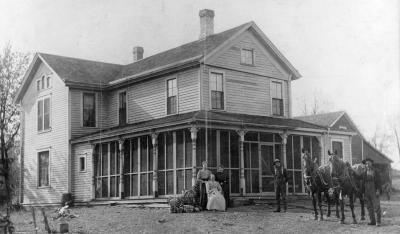 The Baillif Hotel was called a halfway house because it was situated near Nine Mile Creek, about halfway between Fort Snelling and Shakopee. Intersection of Penn Avenue and Old Shakopee, circa 1900, shows the Baillif store, the grange hall and the town hall. The John Brown house, constructed in 1868. Several generations of descendants farmed here until the late 1960s. The Brown farm qualifies as a century farm. 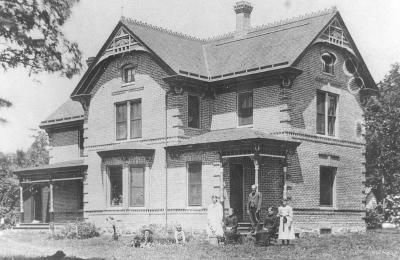 The Rene Baillif home, located at 106th and Humboldt, was built in 1875. Three generations of Baillifs lived in the house, a certified class 1 historic structure. Cates School, at Lyndale Avenue and Old Shakopee Road, was built in 1866, destroyed by fire in 1873 and rebuilt in 1874. It was located at Cloverleaf (Oxboro) Shopping Center. 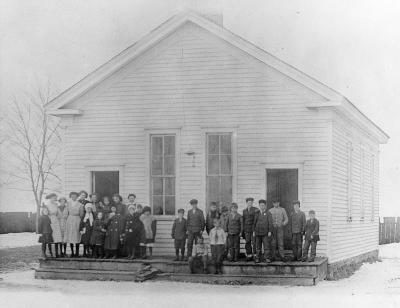 Students attending Palmer School, circa 1900. 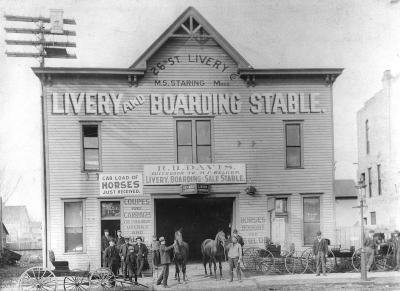 Alivery and boarding stable was located east of Nicollet on 26th Street in the (approximate) late 1890s to early 1900s, before the automobile. Jerry Scott Store on west side of Cedar Avenue was south of Old Shakopee Road. 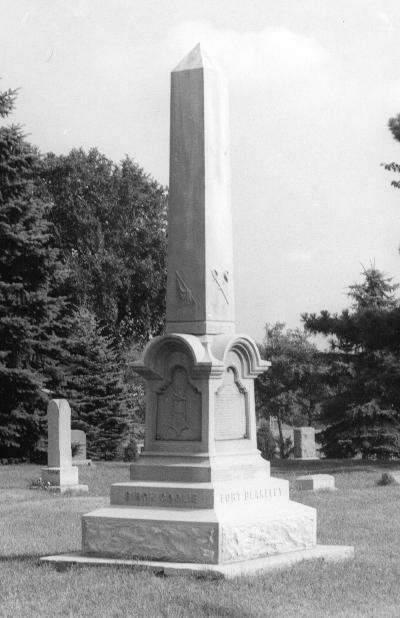 This monument in the Bloomington Cemetery commemorated the Civil War dead. Forty-four Bloomington men fought in battles at Antietam, Gettysburg and many others.